THIS IS A VERY NICE 1-OWNER CYCLONE THAT WAS ONLY USED A COUPLE OF TIMES. IT WAS ORDERED WITH LOTS OF OPTIONS THAT MOST DONT HAVE ! 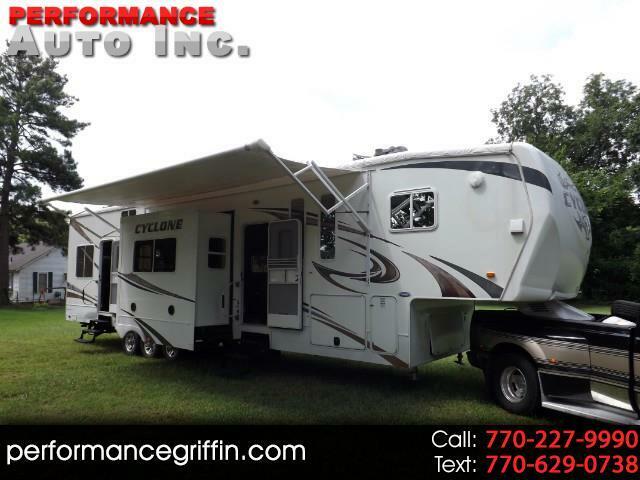 DISH SATELLITE, POWER REAR LIFT GATE, WASHER AND DRYER, CENTRAL VAC, POWER JACKS, LEVELERS AND AWNING, 5 TV HOOKUPS, OUTSIDE FUELING STATION AND SPEAKERS AND SO MUCH MORE.......... THE GENERATOR ONLY HAS RIGHT AT 100 HRS ! THE INSIDE OF THIS CAMPER IS AS NEW ! THE OUTSIDE IS REALLY NICE BUT DOES HAVE SOME FADING ON THE GRAPHICS. THIS ONE IS READY TO GO CAMPING AND PRICED TO SELL QUICKLY ! CALL 770-227-9990 DAYTIME OR 678-614-8910 ANYTIME. Visit Performance Auto Inc online at pending.com to see more pictures of this vehicle or call us at 770-227-9990 today to schedule your test drive. Message: Thought you might be interested in this 2011 Heartland Cyclone.